The Emary family ran several hotels and Frances and Susan's names appeared in directory listings and advertisements as proprietors. The Castle Hotel opened in 1807 as Emary's Castle Inn Family Hotel. 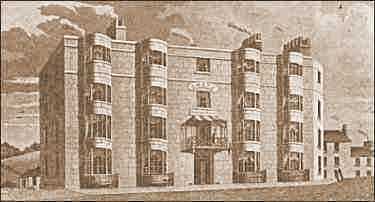 In 1855 Miss Frances Emary was listed as proprietor of "The Castle Hotel & Posting House, Wellington square." The Castle Hotel is pictured below, and on the left of the illustration right. Situated on the corner of Wellington Square and Wellington Place, it faced the foot of the West Hill and the bedrooms had fine views of the castle ruins as well as the sea. (It was demolished and replaced with a supermarket. A discount store now occupies the site). 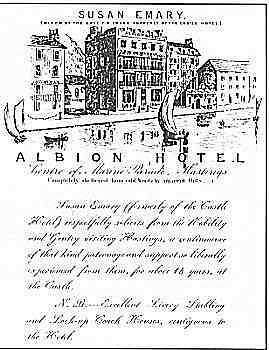 Susan Emary (formerly of the Castle Hotel) respectfully solicits from the Nobility and Gentry visiting Hastings, a continuance of that kind patronage and support so liberally experienced from them, for about 14 years, at the Castle. N.B. Excellent Livery Stabling and Lock-up Beach Houses contiguous to the Hotel. This list was taken from the Census and reveals nothing of the wealth of those listed. Some may have owned a string of fine residences; others a few slum cottages. They were all, of necessity, spinsters or widows, since a married woman could not own property. Jenny Phillips, 14 High street. Age 65. Lucy Croft, 80 High street. Age 54, a widow. Employed a paid companion, and one servant. Mary Wingfield, 88 High street. Age 45, single. Ann Phillips, 95 High street. Age 44, a widow with 6 children. Lived with her mother. Sophie Whistler, 22 High street. Age 47, single. Ann Scrivens, 90 High street. Age 74, lived with her son, a solicitor. Martha Aldridge, 10 Waterloo Place. Florence Adamson, 17 Marina, "Proprietor of land and funds", A widow aged 24.